Music that Makes Community is coming to town! 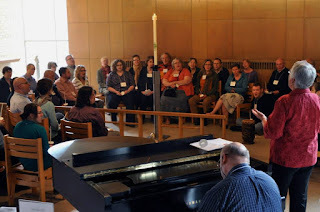 Paul Vasile and I will be leading a bunch of paperless songs, sharing the basic skills of leading paperless singing, and inviting you to try your voice in leading a song or three during this day long workshop. This day will have a special focus on songs from many faith traditions. When: Saturday, January 21, 9 a.m.-4:30 p.m.
Music that Makes Community has been more influential to me than these tagged posts describe.